A red bridge passes over the Berrendo River on Red Bridge Road just north of East 19th Street on the outskirts of Roswell. Nowadays it’s more of an orange bridge from years of weathering. Just east of the bridge is a dam that, legend has it, was built by former Lincoln County Sherriff Pat Garret. The dam creates a body of water that historically has produced and held good-sized largemouth bass along with other fish species. Longtime anglers tell stories of how they once came to this location and caught bass in their childhood and speak about wishing it was that way again. Above. An area of the Berrendo River on the outskirts of Roswell offers a quality angling experience and now sports a parking area that can hold up to 30 vehicles. NMDGF photo by Tyson Sanders. Because the properties in this area are privately owned, lack of access has prevented fishing here for years. The only public land is along the red bridge itself and the county road right-of-way, but fishing off the bridge is prohibited due to safety concerns. However, hope springs eternal. Despite a variety of challenges, following three years of work a portion of this stretch of river is again open to fishing. 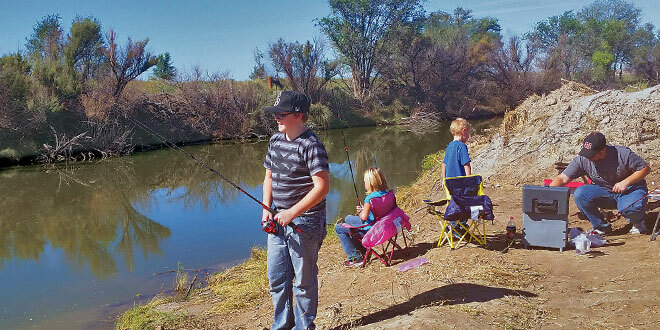 Through the New Mexico Department of Game and Fish Open Gate Program, landowners to the west of Red Bridge have entered into an agreement to open access to licensed anglers on the Berrendo River. “There were a variety of obstacles, but bringing this opportunity back to the community of Roswell, and anglers in general, has been a goal for some time,” said Ryan Darr, lands program manager for Game and Fish. “The property provides about a half mile of riverside access with waters that should yield some good bass in an underserved area,” said Shawn Denny, warmwater fisheries biologist for Game and Fish. After receiving an importation permit from Game and Fish, Bill Fenn, an adjacent landowner, stocked the Berrendo River Open Gate property with 600 largemouth bass ranging in size from 1.5 to 4 pounds on Oct. 6, 2016. Along with the stocking, the Chaves County Flood Control worked to create an impressive fishing area and a parking lot that can hold up to 30 vehicles. Sportsmen for Wildlife provided the initial setup for trash removal on the property. There was a good deal of additional support and cooperation. Game and Fish has posted signs on the property and personnel are working to address the potential challenges of a high-use area, such as keeping people out of closed areas and making sure people leave by sunset. The bass fishing will be catch-and-release only, with bag limits posted for trout, bluegill and catfish. “We ask the public to respect the property and obey the posted signs because this amazing opportunity can disappear quickly,” said Capt. Andrew Gray, a conservation officer with Game and Fish. “It is against the law to violate posted signs on an Open Gate property. “This is a great opportunity for the public. With recent public recreation closures in Roswell, the youth of the community need fun and safe activities to occupy their time. Game and Fish is excited to play its role in improving recreational opportunities for the Roswell community as well as anglers,” Gray said. The property is a few minutes from Roswell by car and is within bike-riding or walking distance for some people of the community. The parking area for the property is located off Red Bridge Road, .3 miles north of East 19th Street on the west side of the road. There is a large metal trash container and outhouses for public use on the property along with the parking area off the county road. The property opened for licensed anglers on the Berrendo River on Oct. 1, 2016, giving those longtime anglers an opportunity to recapture their youth while newcomers now have the chance to make lasting memories. Open Gate is a program that leases private lands to improve public access for hunting, fishing, and trapping. Open Gate leases are funded exclusively by hunters, anglers, and trappers through the purchase of the Habitat Management and Access Validation. To learn more about the Open Gate program: click here. Tyson Sanders has worked for the New Mexico Department of Game and Fish for eight years and currently serves as the Roswell corporal. He can be reached at (575) 840-7483 or tyson. sanders@state.nm.us.